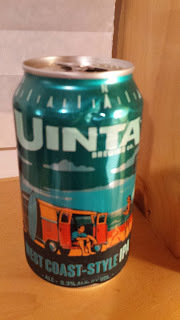 This week's Sunday Night Suds looks at Uinta's West Coast Style IPA. The West Coast Style IPA is one of the latest offerings by this quality brewery. Although the neither the can nor the website explain where the beer derives its name from, the website identifies four hops which give this beer its unique flavor -Denali, Mosaic, El Dorado and Chinook. The beer is on the higher end of the abv spectrum (for a single IPA) as it is 6.30% abv. There is quite a bit of hop bite in the beer and even though I had a bad cold when I drank it with Mrs KB's awesome salmon dinner (you never know what you can find under hashgacha in the local Walmart) I could taste the pine and even a bit of the alcohol backbone. The website indicates that the beer has pineapple, mango and pine elements. I tasted the pine (see above) and even a bit of the mango. I did not detect the pineapple but this is not surprising since the beer is unflavored and I had a cold (also see above). 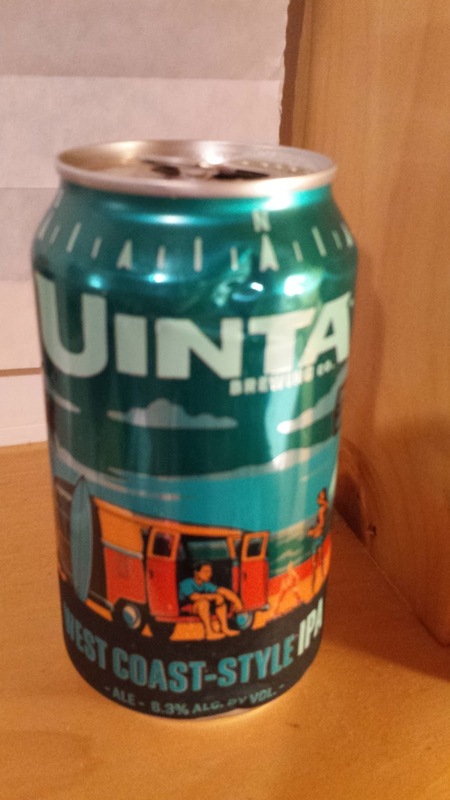 Uinta West Coast Style IPA is certified kosher by the Orthodox Union and bears an OU on the can For the experts' take on the Uinta West Coast Style IPA, please click here www.beeradvocate.com/beer/profile/1416/285570.